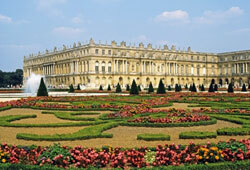 Symbol of France glory, Versailles is a complex of castles and palaces. It was the residence of the most important kings of France : Louis XIV, Louis XV and Louis XVI. The palace in itself with the Hall of Mirrors and the State Apartments of the King and Queen consists of a succession of buildings displaying a magnificent architectural harmony on 67 000 m² and more than 2000 rooms. The park is more than 800 ha wide with 90 ha of gardens and famous sites like Petit Trianon and Grand Trianon, the Grand Canal, The Orangerie and the Queen’s Hamlet. Nowadays Versailles Palace is one of the most visited places in France because of its architecture, its fantastic gardens and also because of its history. The Hall of Mirrors connects the two aisles of the palace, it is 73 m long, 10 m wide and 12 m high. 17 windows enlighten the Hall of Mirrors and it is adorned with 357 mirrors which making was a technical challenge. The paintings on the ceiling depict military victories from the 20 first years of Louis XIV reign and are a tribute to the king’s power and glory. 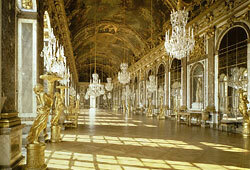 The main purpose of The Hall of Mirrors is to amaze the visitor passing there. The king used to hold his special audiences there and have his throne of silver brought for the circumstance. It was naturally the favourite place for the court’s major festivities. The walls of oversize mirrors reflect to the visitors thousands of images of the gardens. The decor is a real masterpiece : the whole surface of the ceiling, of the tapestries and of the furniture is dedicated to the king’s virtues, the walls are marble-panelled, the royal collection of statues and antique busts was displayed there as well as paintings (some of them are at the Louvre now). As for the salons of the Grand Appartement du roi, the ceilings of the rooms of the The Grand Appartment de la reine are dedicated to the heroines of mythology. 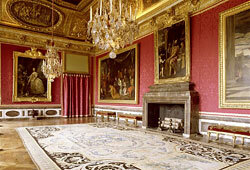 The queen used to spend most of her time in her room where she received the ladies of the Court in the morning for her levée and granted private audiences. The furniture you will see during your visit is mostly the one that was in the room in 1789 when the royal family was arrested. 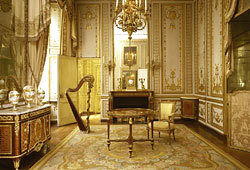 Marie Antoinette fled through the door on the left to escape from the rioters who had burst into her apartment.